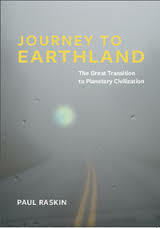 Journey to Earthland is a recently released book by the Great Transition Initiative (GTI), a worldwide network of activist scholars with a unique purpose—to advance “a vision and praxis for global transformation”. Few civil society organisations have such a broad focus on transformational strategies towards a new global social-ecological system, as condensed and overviewed in this latest publication by GTI’s director, Paul Raskin. The short and accessible book presents a majestic overview of our historic juncture and expounds the urgent need for systemic change, with a hopeful vision of a flourishing civilisation that has long inspired Share The World’s Resources (STWR) in our complementary proposals for peaceful mass civic engagement. This is where STWR’s advocacy position departs from the GTI, despite fundamentally agreeing with their broad analysis and vision for a consciousness shift towards a Planetary Phase of civilisation. To be sure, the greatest hope for the future rests with new solidarities being forged on the global stage, with the welfare of the collective whole being prioritised above the welfare of any one particular group, class or nation. But what does this actually mean in the present moment, when discrepancies in global living standards are so extreme that millions of people are currently at risk from dying of hunger or other poverty-related causes, while 8 billionaires own more wealth than the poorest half of the world? Furthermore, is it realistic to expect the 4.3 billion people who subsist on less than $5-a-day to join a global citizens movement, if their basic socio-economic rights are not at the forefront of any such planetary endeavour? As STWR’s founder Mohammed Mesbahi has explicated in a different kind of political treatise titled Heralding Article 25: A people’s strategy for world transformation, such unprecedented protests across the world may be the last chance we have of influencing governments to redistribute resources and restructure the global economy. It may also be the only hope for initiating a global citizen’s movement, bringing together millions of people for a shared planetary cause—and ultimately paving the way for all the social, economic and political transformations that are inspiringly promoted by the GTI. This article was posted on Tuesday, February 28th, 2017 at 3:09pm and is filed under Book Review.